Old Coleman Parts Online Store > Categories > Just Bull > 'Tis the season... for electrolysis! My outdoor electrolysis vat froze on me while cleaning some CI for a friend early last fall. It finally thawed out! Cleaning the rust off a friend's 425H stove manifold. The stove appears to have been stored in a tub of water for a few years. You need to start a string on the one thousand and one things you can do with a beer keg. Shoot, I'm not even up to a dozen yet... brewery sinks, mailbox, woodstove, home brewery vessels, flower pots... and electrolysis vat. Before anyone jumps in with the hazards of using SS for an electrolysis anode, last year I sent a sample of the electrolyte that I had been using heavily for over a month off to our water lab and had it tested for chromium and chromate ions. The test came back "below detection threshold". That’s a pretty awesome setup. How long does the tank last before it starts to spring leaks? Urinal basin, lantern fount, hotrod fuel tank, industrial wind chimes, badger traps, drum kits for the band Slipknot, solar oven...the list goes on and on. I use electrolysis for my pre-WW1 shotgun restoration. I find hot water and a heat lamp helps accelerate the cleaning. I have big tanks for doing damascus and steel barrels. I love electrolysis. Lazy man's de-rustificatin. Better living through chemistry. 3 years in, and no evidence of any erosion of the stainless steel keg. Beer kegs these days are made from 314L stainless, so pretty hard to kill. The woodstove I made drew lots of skeptical comments re: how long it would take to burn through. For my first test firing, I loaded it up with very dry hardwood (old pallet scraps) and melted a beer bottle on it. 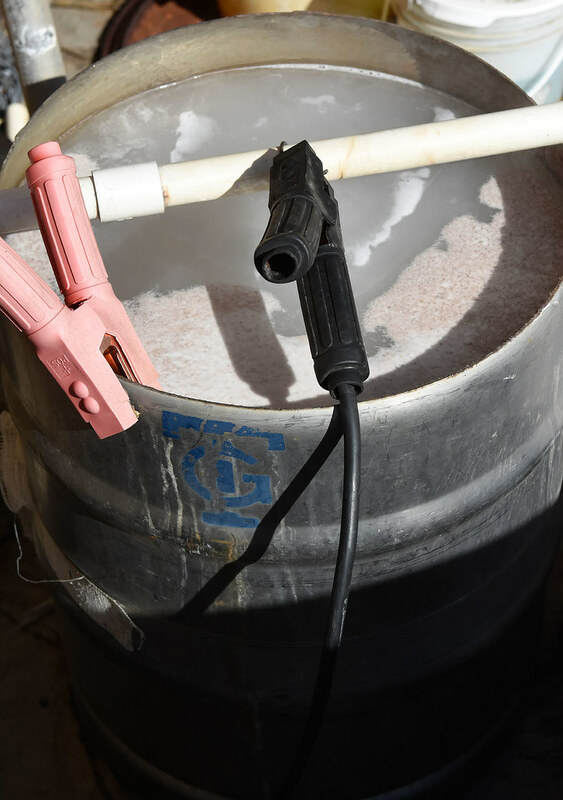 The keg was glowing white-hot, and suffered no more damage than heat staining. It's been in use for four years now, and doing great. Too many people think that any silvery metal is aluminum. It's even in The Book, referring to the "aluminum" keys for the auxiliary burners on suitcase stoves, which are galvanized steel. Then it sounds like I need to find a keg to upgrade my electrolysis setup. I've done several vise restorations using electrolysis, along with a very old (Made in the city of Boston, MA) pipe wrench my brother in law found in his yard when he moved in several years back. Went from completely frozen up to smooth operator. Works wonders! My name is Dave, and I'm in Rhode Island. What are you using for this process, needing to de-rust all these heater parts and looking for an easy "solution"
A couple tablespoons of “washing Soda” is typically recommended. If you can’t find any “Baking Soda” works nicely as well. Some people say to use harsher chemicals but I don’t see any reason to risk using something hazardous with the results I have seen using baking/washing soda. The more important thing is your anode(s) setup. I use washing soda for the electrolyte, which I found at Wal-Mart in the detergent section (Arm & Hammer). I use a simple five gallon bucket most of the time, with an old school (non-automatic) battery charger for the power source. There are a lot of vids on YouTube on how to set it up. 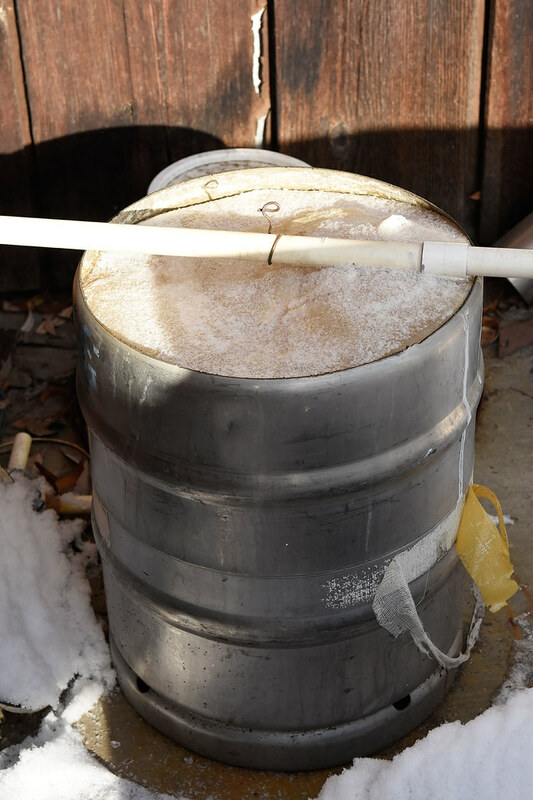 I am surprised the keg did not split when the water froze. Me too! It didn't even swell it. All the force seems to have gone upwards. It surprised me even more that it froze at all while in use. There's a CI dutch oven in there, and the battery charger was indicating 6 Amps @ 12V the night before. Seems like plenty enough to keep it warm.